Koel Vrieshuis Reimerswaal has a 200.000 m2 storage capacity with separate units for cooling and freezing of every possible food and non-food products. Koel Vrieshuis Reimerswaal guarantees an uninterrupted cooling sequence. 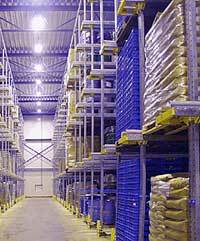 The various units are fitted with "drive-in" racks, with a maximum storage capacity of 45.000 pallet spaces. Open units for bulk storage are also available. Using our shock-freezing equipment, your products will be deep-frozen to a temperature of -20 C in a very short period of time. The capacity of our freezing tunnes is 500 tonnes per day. Koel Vrieshuis Reimerswaal has a 200.000 m2 storage capacity with seperate units for cooling and freezing of every possible food and non-food product. Koel Vrieshuis Reimerswaal guarantees an uninterrupted cooling sequence. The correct temperature (from +10 C to -28 C) is determined in consultation with the customer. All thermostats are monitored continuously via an ingenious computer system.